As we enter 201 lets talk about building your brand as a florist. 17 Tips that will get your florist business noticed. Dont always go with the cheapest option when having your Logo designed. A professional designer will work with you to create the logo that suits your business. They will advise on the choice of colours that will work for signage and any other areas you will use your logo. When we had our Logo designed by Denise from Inspired Design, she changed how we thought about our business and helped us create a logo that represented our brand. Since having our Logo created, more and more people seem to recognise us and our business. Having a fabulous website is only half of it. You need to keep it updated. You need to work on your SEO - Search Engine Optimisation, What is this I hear you ask, well it is how Google Finds your website and shows it to your customers. I would advise you doing a basic SEO course and learn how it works so you can do it on your own website. Every Photo you upload to your website should be named and every photo should have a different name. 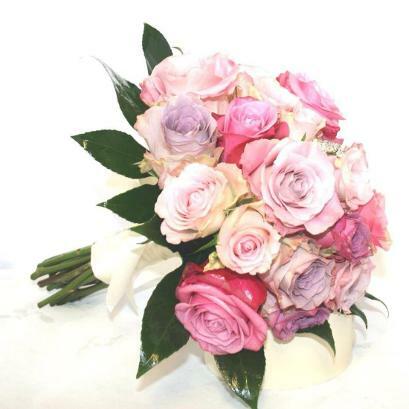 So the photo below here is named on my PC as "Wedding Bouquet of Pink Roses at Kays Flower School" , on my website the alt text is "Pink Bouquet of Roses at Kays School"
You can see how you can easily change the name but using the same description, so now if someone googles "pink wedding bouquet" "pink rose bouquet" "pink roses" ?? This image may come up in their search, drawing traffic to your website. This is just One SEO tip for florists, especially as images sell our trade. Facebook is a fantastic free tool for florists to display their designs and creations. If you dont already have a Facebook page, set one up now. Students say to us, "oh i dont like being on Facebook" you dont have to be personally buy your business does. Use your Business Name and start posting images of your work, you should be posting 2-3 times per day. Video gets seen more than anything else, so if you dont want to talk on the video yourself, video your shop, your flowers, your designs, just get content up there about your business. Nothing is better than a testimonial or review from your customers. After you have provided a service email your customers and ask them to review your business on facebook. Not a lot do, but some do and thats what you need. DONT remove or block negative reviews. By doing so you will irritate the poster and they may then get all their friends to post on your page also. Deal with it and address the customers complaint, dont get annoyed or smart, keep your response professional and apologetic. The nicer you are the harder it will be for them to respond with more negativity. Twitter is an amazing platform for brand awareness for your business, you may not get direct business from it, but you will become recognised as a professional in your field. From this you may be contacted by radio stations or journalists to discuss flowery matters. This can be the best advertisement your business will get and costs nothing. I know it seems like an easy option to post on one and automatically post on the other, but one of these FREE platforms will suffer as a result. Social Media is about being social and talking to people. It would be better not to post that to post an automatic linked post. Instagram is a huge relevant growing network and an amazing place to show off your designs. It is important on Instagram to use Hashtags (#) this is how people will find you. If you are posting the photo that we used above it would be #Pinkflowers #Weddingbouquet #pinkweddingbouquet #weddingflorist #weddingflowers #kaysflowerschool #topflorist search hashtags on Instagram and you will get the hang of it. We all know about Pinterest, every bride that comes to us has their dream wedding board on pinterest, but maybe not the dream budget. But Pinterest is very useful for florist when looking for inspiration or ideas to decorate different types on venus. Be aware that some the fabulous flowery venues on Pinterest are probably a photoshoots and not necessarily real weddings. But like all platforms, your business needs to be there. No its not just for teenagers, Snapchat is growing within the adult sector too. Snapchat is just that, chatting through snaps. Im not sure how or if it helps to build your brand, we have been on it for a few months now, but like everything else, if its online, you need to be there. Linked is a completely different social media platform, but you will find most of these on Linked in may be your customers. It is good to be on there and build up relationships with local business in your catchment area. Get yourself and your staff some training in all of the different social media platforms, it teaches you to be more efficient and productive with your time using these networks. Below are a list of experts in the different social platforms. Funding may be available from your Local Employment Office for training in the above also. Blogging is a fantastic way of increasing traffic to your website and also promoting your expertise. Blogs do not need to be thousands of words and can be lots of photos also. Maybe blog about your most recent wedding, remember your basic SEO when adding the photos. You could blog about seasonal flowers, blog about yourself and how you got into the flower industry. Remember with blogging, you can blog about anything just dont get too controversial and upset people. You have your logo, now use it. Brand your Aprons, Jackets, Car/Van, Cups, Floral Boxes, Business cards, Ribbon. Anything that can make people aware of who you are and what you do, brand it. Use your Brand Logo for all your Social Media Profile Photos. Every Letter / Card or Envelope sent out has your logo on it. We recently bought a rubber stamp with our logo on it and makes branding envelopes much easier and cheaper. Using your Logo create a colour scheme for your Flower Business, use the colour throughout everything you do and all your floral designs in so far as possible. Overtime customers will recognise your packaging and when they think of flowers they will think of your packaging and recognise your logo and will most likely google you and because your website is so fab they will find you. All of what we discussed can be time consuming, but we all know we are living in the Digital Era, Social media is not just for fun it need to be part of your marketing stragedy. It is not going away, dont be left behind, make 2017 your year to catch up on your place on the World Wide Web.